LG is all set to announce the G5 at a special event at MWC on February 21. And while we wait for that to happen, the Korean company is teasing us about the handset's features. Behind the scenes, however, LG is also extensively testing its newest creation, as you'd imagine. 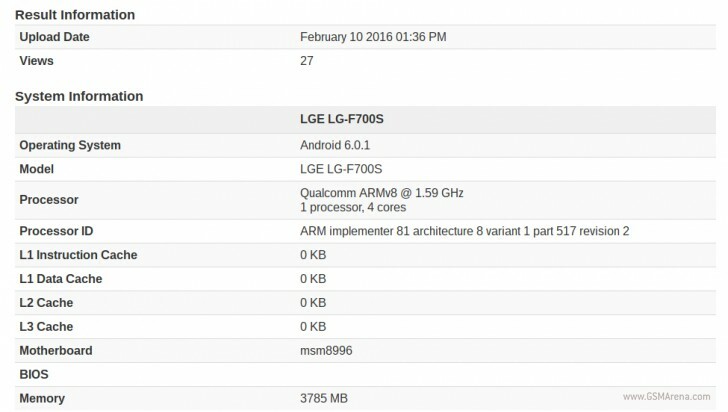 In fact, someone with a G5 prototype has run Geekbench on the thing, and that has resulted in a couple of its specs getting confirmed, along with the fact that it runs Android 6.0.1 Marshmallow. The information gathered by the benchmark says the G5 sports Qualcomm's Snapdragon 820 chipset along with 4GB of RAM. None of those are surprising, of course, as the presence of both should be par for the course in a flagship Android device in 2016. The phone that was tested here is the LG F700S. That "S" means it's meant for SK Telecom, one of the three carriers in South Korea. The model number, F700, strongly implies this is the G5 we're seeing here. That's because for its home market LG has used F600 to describe the V10, while the G4 had the model number F500. So by that logic, the next high-end smartphone from LG is the F700. Which will be known commercially as the G5. The LG G5 may arrive with a modular design of sorts, its volume buttons on one side (not the back), a 20 MP rear camera, an 8 MP selfie shooter, and a 5.6-inch QHD touchscreen, previous leaks have said. G2 was the perfect size. So accordingly to your theory in a few years you will be using a seven inch smartphone?